Can psychedelics do for psychiatry what the microscope did for biology and the telescope to astronomy? Can they be used to access on the depths of the psyche that are usually inaccessible? Psychedelic means: "mind manifesting"
Psychedelics were inextricably associated with the hippie counterculture of the 1960s and, more recently, with the rave music scene, and were once believed to hold great promise for treating a number of medical conditions as well as providing access to profound spiritual experiences. However, legal restrictions on the use of such drugs effectively forced them underground and brought clinical research to a halt - until recently. 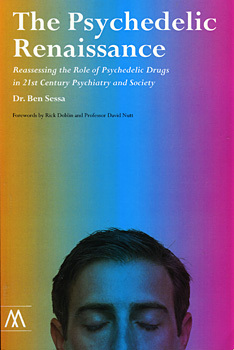 In this book, psychiatrist Dr. Ben Sessa makes a persuasive case for the re-evaluation of psychedelics - LSD, MDMA ('ecstasy'), DMT, psilocybin, ayahuasca, peyote, ibogaine, and more - as he explores their clinical potential for treating a range of conditions from post-traumatic stress disorder and depression to autism and cluster headaches. Based on a thorough review of the evidence, Sessa corrects some common misconceptions about psychedelics and makes a clarion call for their responsible therapeutic use, with appropriate set and setting, in psychotherapy, psychiatry and personal growth. With clarity and wit, the author surveys the contributions of major figures in the psychedelic movement - from Huxley, Hofmann and Sandison to Leary, Grof and McKenna - and takes the reader on a journey through the fascinating history of psychedelic plants and chemicals as he considers the crucial role such drugs have had in human culture from prehistory to modern times. Dr. Ben Sessa is a NHS Consultant Child and Adolescent Psychiatrist working in Taunton, Somerset with children and young people with a wide range of severe mental disorders. He trained in medicine at University College London and is a member of the Royal College of Psychiatrists.